What are the typical prices for cleaning a house? Here is a chart of the national averages of cleaning company pricing. Setting your cleaning company pricing is one crucial factor in establishing a successful business. The worst thing that can be done to set prices based on some non-existent, mythical norm or so-called “average.” Begin by understanding that when the customer asks what amount you charge, what they truly want to know, is what amount is your service worth. Worth is subjective term, meaning different things to different people. A specific price is set for a definitive size, or unit, of space. Personally, I could never use this approach because in reality, there is no such thing as a definitive "unit.” Spaces are all very distinct, and this approach never accounts for any obstacles in the situation. This is most common with carpet cleaning services, where for example the company offers one special price for 1,2, or 3-bedroom apartments or one 1,500 square foot home. Frankly, this pricing method is lazy and unsophisticated. You can offer three to four different package deals that hopefully their situation fits into. Again this works best for carpet cleaning businesses. Package A may include just vacuuming, shampoo and drying. Package B is the same as but also includes moving furniture and carpet protector. Package C is the same as B and also includes spot cleaning, deodorizing and fabric repairs. And so on with Package D. You really do not want more than five packages and you want at least three. The psychology is such that you are warming people up to purchasing more services while prompting them to do so. Most people do not want the least, they want the most, but you have to step them up to it. A common example for package pricing is the car wash. They give you five packages knowing that most will pick the middle package the most often. In this approach, the hourly rate is added to the cost of materials to get the bid. So if it is a job that will take three hours and you charge $40 per hour, then your bid would be $120 plus $5 to cover the cost of materials. Usually, it is a good idea to take a walk through the space to make sure you are properly assessing the time needed. This is the method I employed, and I was often shocked how well it went. I also learned to have a poker face. Once you are very familiar with all of the above methods, you will actually become increasingly effective. Do this by using your experience, and your practiced intuition about the client and their values. The trick with intuitive pricing is to not obsess on whether or not you land every single job that you bid on. It is easy to get into a space where you want and need every job. However, if you are marketing your cleaning services intelligently, you are going to catch the eye of far more people than you could ever need. This allows you to go for the highest price. People new to being in business often get really upset when they do not get a bid. Why? Seriously, what are you actually out, about a half-hour of your time? One good job can pay thousands of dollars. If you spend a few hours to get one great job, that time was well worth it. Here is a common scenario. You give out five bids which takes you about twenty minutes each, which adds up to one hour and forty minutes. You land one job for $150 twice a month, which equals $3,600 per year for that one job. If you do that job for three years (the average length) that adds up to $10,800! Wow, and you are worried about being turned down four times and losing an hour and a half of your time. That's just bad reasoning. You might be very surprised at the amounts I have been paid, at times, to clean a house. $320! One time, I was about to give a quote and at the last second I asked my potential customer, "what would you like to pay"? They named an a figure twice as much I was about to charge. Value is all over the place for people. The trick is how do you find out what they think a fair price is? It is very tricky and risky, it is part art, part intuition, part detective work, part gamble and always part luck! 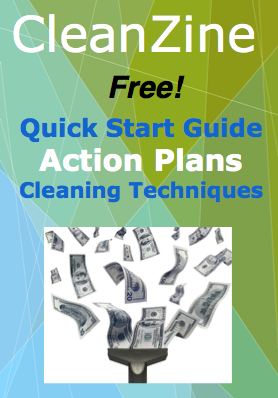 There are many creative ways to set your cleaning company pricing and you do not have to do it the same with every client. One great aspect of cleaning is that your clients do not know each other, so you can experiment using different pricing scenarios and structures.